Congratulations GHES!! – Glen Haven Elementary was recognized as a Silver Positive Behavior Interventions and Supports (PBIS) Maryland School. Go Eagles! Now we’re going for the gold! Hurricane Donation – Montgomery County Public Schools and the Montgomery County Public School’s Educational Foundation, Inc. are working together to raise funds to aid in the recovery of schools in the areas affected by Hurricane Harvey and Hurricane Irma. If you are interested in donating, please use the below link. Thank you for your support! 10/3 – PTA Meeting- Tuesday, October 3, at 6:30 – 8:00pm. Please come and join the PTA for free pizza at 6:30. The meeting will begin at 7:00. Feel free to bring the kids. 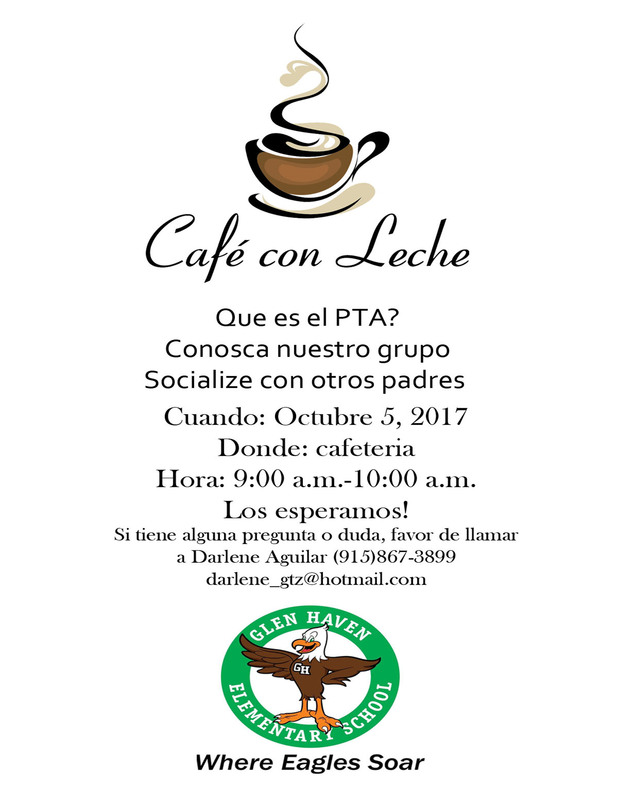 Alpha Best will provide child care once the meeting begins..
10/5 – Café con Leche- 9:00 – 10:00am in the Glen Haven cafeteria. Please see the flyer for more details. Walk to School Day – October 4 is International Walk to School Day! Casseroles for a Cause – Help fill freezers with delicious meals that will feed hundreds of folks in our community. We need your help to stay home and cook any time on October 7. See link below for more details. World of Montgomery – On Sunday, October 14, celebrate the diversity of the DC area through international music, food, dance, and hands on activities. See the link for more information!